Here is simple explanation of wardriving: you drive around in your car and detect wireless network with the helps from stumbling utility and GPS (Global Positioning System) receiver. The detected access points can be plot in electronic map later and uploaded to website for sharing the data. Here is an example of wardriving map which I downloaded from Internet. Those red dots represent the wireless network with encryption, whereas green dots represent the network without encryption enabled..
As for myself, sometimes I just walk around my neighborhood and scan for available wireless network by using a notebook equipped with wireless adapter and network stumbling tool Netstumbler. So far, I’ve been locating quite some unsecured access points. However here got one advice, don’t connect or trespass onto those detected wireless network, you can be prosecuted if you do it. 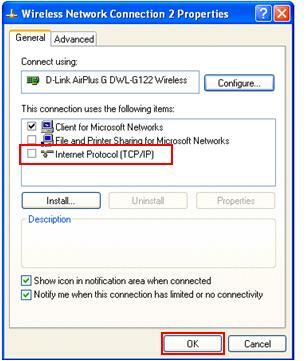 In order to avoid from accidentally connecting to wireless network, you should disable your Windows TCP/IP stack when you do access point scanning. By doing this no IP will be able to assign to your network card by DHCP server even you connected to the network. 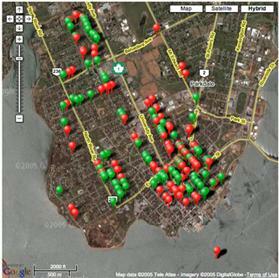 - Check the growth of wireless network around neighborhood. This is also the way to identify those available public wi-fi hotspots. - Identify unsecured access points. If you know the owners, you can also advise them on the danger of their network. Remember to only look at the network but don’t touch it!!! Return to top of "Wardriving How-To"! !